Whistling down chimneys and banging on doors the new year has blown in on the back of the wind. It announced its arrival by hurling rain at my darkened window. It sounded just like a round of applause. Through my dark window I glimpse the Moon and my breath is stolen away by its presence. That great big shiny coin is just hanging there, low and golden in the sky like unspent riches. Its aura so bright that I feel I have happened on some piece of magic not usually destined for mortal eyes. A gust of wind - and a flurry of yellow gold leaves take to the air and soar over my fence like birds. November has bought more light into my north facing room. The trees have dropped their verdant graces and now stand naked against the colourless sky. Intricate silhouettes softened and blurred by the gentle falling rain. It has been so long since I last waited for the dawn, there is magic in that liminal place as we cross the threshhold from dark to light. So here I sit in this dark room, watching as the soft pink light gently dissolves the darkness into a new day. The constant trees beyond my window, stately stood against the sky. Clouds adorned with whirling jackdaws. How I wish that I could fly. And the sky was full of mountains, snow white and edged with light. Billowing turrets set against the brightest blue. They made me catch my breath in awe. What a privilege to be alive and to be conscious of it - and of the splendour of skies such as these. Dawn breaks and tumbles over the horizon in pinks and pearls, trailing light from the east. The land gives up its bat filled darkness and the night creatures scurry home just before the first bird begins to sing. The air is still as feathers and the yellow sun nowhere to be seen. From the top of the old ash tree, a crow shouts. . . his voice resounding like a claxon, sending sound waves shimmering through the static air. Geranium, white, a punctuation in this monotone scene. My eyes roam, restless, searching for somewhere to settle. At last, amidst the roaring greens I see it. A splash of yellow glowing like grounded sunshine. Shadows shifting. Soft grass splashed with sunlight. Shimmering leaves throw down their yellow gold beauty like blessings bestowed. The green velvet ground at my feet is laden with jewels. The light through the trees is beautiful. Low golden sun touching the remnants of this dark day. Oozing from the edges of leaves and falling into liquid amber pools, its soft fingers spread honey on the cold hard ground. The hushed night falls as quiet as a breath over my garden. Silhouetted against the indigo sky, bats navigate at speed, swooping low and agile. Nocturnal birds weaving their dark magic into the fabric of the coming night. Through the trees, a band of fire sets the horizon alight. The Sun is singing its radiant farewell, leaving the marshmallow sky to ready itself for another night. Illuminated leaves, petals painted with light. A shaft of sunshine visits the darkest corner of my garden. I saw the feeble white flutter of wings, stifled. Wrapped in a skein of spiders silk, its beauty captured. I reached out my hand and broke its chains, freeing it from its single thread shackle. It fell to the green leaf safety net below, and I knelt and pulled away the sticky rope that had it bound. White wings flickered open and closed, as if to be sure it was finally free. I smiled as it took to the air, circling up into the deep blue of the afternoon sky. Cats running, tails raised, after the moving plate of food. I sense the stillness, the silence, as this greyscale evening seeps into my psyche - permeating my aura. The sky's grey mantle, a lid upon the world. It adds a weight that I can feel right down to my bones. I awaken, heart pounding, terrified. The nightmare still has me in its power, so I reach out to stir my partner. "Are you okay?" he mumbles as he surfaces from sleep, then continues with a disappointed tone to his voice. "I was dreaming I was baking cakes, and now I won't be there when they come out of the oven." I feel the giggle bubbling up through my fear. Drystone wall, lichen covered and beautiful. Orange and pale green tell stories of time passing. Old man taps his cane, I feel the floor vibrate under my feet. Hushed conversation overheard. "Do you like yoghurt". He yawns and looks away. The wind makes my garden speak. It runs through the greenery, whispering and telling tales. A swirl of butterflies ascend skyward, weaving their white magic against the endless blue. The sinking sun paints the soft white clouds yellow. Crows shout their goodbyes to yet another day. Waiting room, silence broken by hushed whispers. Outside, the sky hangs heavy and grey over the red brick buildings. His big hand is warm, he curls his fingers around mine and squeezes. A small gesture that speaks volumes. She comes with clipboard and calls his name. He gets to his feet and quickly leaves the room. Silence resumes. Yellow light dazzles and daubs. I am smeared in sunshine. Rain darkens the tree trunks, the skies, the bench in my garden. Splashing and dripping in translucent drops, it falls to the grateful and thirsty land. She sits on the windowsill, tail wrapped around her delicate paws. The light catching her profile and highlighting the cream coloured patch on her nose. She turns and sees me watching and begins to purr. I hear the soft rumble of the kettle as it comes to the boil, then the chink of spoon against cups. I smile, knowing that he is making us both a cup of coffee. Dark earth, hard crust gives as I plunge in my trowel. Careful transplanting of self set seedlings complete. I clear space for the courgette plant that has been waiting to put down roots. The tiny bird and his shadow sit on my fence top. He has his back to me, but I can see his little body moving. And though I can't hear it through my double glazed windows, I can tell that he is singing. . . The trees are backlit with a shimmering honey aura, their foliage all aglow. Changing light weaves a special magic that only those who watch the skies will ever know. The melancholy landed on my shoulders. I felt it settle, like soft familiar hands. It seeped into my skin and slowly permeated my being, like luke warm warm liquid poured into my bones. Soft pink morning light casts its shadows, like nets, upon my gardens green ocean. Natures intricate etchings, inking the canvas of my fence. With the ever shifting dance of light and shade, everything looks twice as beautiful in my garden today. . . Slow moving cars crawl to a stop. Beneath the bridge the motorway traffic hurtles onward. There between the exhaust fumes and sunlight, a tiny white butterfly flutters like a floating flower. "There is always something left to love. And if you ain't learned that, you ain't learned nothing." Clouds like curling waves, ride the roughshod sky. Moving at such a pace, I can only guess that the wind is chasing them across the heavens today. Rain bounces from the shiny wet pavement. Dynamic water droplets leaping back up into the waiting air. Branches bend and glossy leaves act as funnels - channelling the water down into kinetic puddles, where the frenetic water continues to dance. The sun fell so quickly tonight. Streaking the watercolour sky with skeins of the softest yellow. Silhouettes appear in the big old tree. The jackdaws are coming home to roost. Clock ticking, marking time as night shadows darken. In the mirror of my uncovered window, I see the reflection of my lamp lit room. On the other side of the glass, a tiny moth flutters. . . In the grey green moment before twilight, a solitary dove lands. Rain drips from the silent bird table and falls to the waiting earth. Speeding by the sunset - a blur of yellow streaks the coming night with gold. From a slow moving plane they emerge. Brightly coloured canopies whirling in the still afternoon air. Like man seeds falling from the sky. I held the mirror upside down today but it didn't change what I saw. Still me, still there, still the right way up. Growing among the rusted metal and stark utility of factory units. The tiny yellow flowers bloom. I wanted to take pictures of the day leaving and the night covering the vast heavens with stars. So I walked out into the moth rich darkness, and was entranced by the intricate silhouettes of trees etched against the sky. The heat haze hangs heavy over the leaf green land. The air has weight. I feel it pressing into my unwilling limbs, wrapping itself around my shoulders like a shawl. I step into the garden and I can almost hear it all growing. Nature is burgeoning, pushing forth with green fingers and blossom. The energy is palpable. I watched the insects busily moving from flower to flower, struck by the fact that they are living their life too. A shared space, my garden, the insects, the birds, this moment and me . . . Pushed by the wind, white clouds sail across the vast ocean of blue sky. On top of my fence a sparrow fledgling chases after its parents, fluttering its tiny wings. No blue today. The sky like spilt milk oozes across the heavens and the green leaf ocean rises and falls as it rides the wind like surf. Outside my window, a Jackson Pollock riot of yellow spattered dandelions transforms the plain green canvas into a giant painting underfoot. And the landscape is alive, as the miniature suns open their intricate and shining hearts to the sky. Awake before dawn, I am draped in a shawl of melancholy. It settles like a fine mist as I emerge into the half light, stranded between sleep and wakefulness. It seeps in through my pores, infiltrating my being. There's nothing I can do but wait, as it gently evaporates, and like a soft cloud sails away on the wind of this new day. I was standing at the edge of the reservoir, watching the breeze draw patterns on the water. The thick white cloud parted to give a glimpse of the brightest blue sky. Then came the transformation - a shaft of sunlight illuminated the ever moving dark water at my feet, dancing upon its surface like a million scattered diamonds. Treading quietly, I slowly open my bedroom door and step out into the softly lit hallway. With one sleep filled eye still closed I am stopped in my tracks, overwhelmed by the sweet smell of hyacinths. Nostalgia steps forward and paints its hues into this midnight scene, indelibly marking the moment. And as dawns grey light heralds another day, it is the first thing I remember as I open my eyes. This morning wears mist like a shawl, a veil to disguise the swelling of the fresh green buds. Today, I can only imagine the traces of spring laying swaddled in the fine gauze that March has casually thrown over her shoulders and wrapped around her still bare bones. There in the distance they have cut down a tree and my wall of nature has now been breached. A new porthole opened up into the world of man. Through it I see a house on a hill and grey sky reaching back to the horizon. These few quiet moments, as the sun dips in the watercolour sky and daytime trees become silhouettes etched onto the surface of twilight. The horizon is glowing flame orange, fading up into purple night. Stillness reigns, as a solitary bird sings another precious day to sleep. Dressed in the yellow light of her spring sunshine, March tiptoed in and left the door ajar. Winter shouted after her as she trailed new life. The coldness of his breath chilling my hopeful bones. For now they coexist, sharing the earth... but as each day passes the scales are tipped in the favour of Spring. Low cloud, grey skies, drizzle. Lichen covered stone. Catkins swaying in the breeze. Tiny new buds emerging from winter twigs. Forsythia's first yellow blazes in the shadows and the hardy evergreen sits solid in the rapidly waking earth. From the kitchen, the rumbling of the washing machine sounds like a distant train. The kettle gathers steam, hissing as it comes to the boil. Closer and much quieter is the soft breathing of a cat, sleeping, and if I listen hard, the almost imperceptable tick of a clock. Then behind those sounds and quieter still, my heartbeat. Rich brown earth, newly ploughed. Turned and ready, it draws me with its fertile promise and vast expanse. It is expectant, awaiting the seed it will nurture and nourish. I want to throw myself down into its warm umber embrace. It is potent. I long to sink my roots, tap the energy I feel there. Ah, soon it will be Spring. Up before dawn. Darkness wanted company so I came and sat with it a while in the gentle and heavy silence. And as the pale pink light began to seep across the sky it let go of my hand and slipped away without a word. She's reading it. Stepping into the world my mind has spawned. Getting to know the figments of my imagination. My words through her eyes. I am no longer alone. She is living the story too. Daybreak's shallow breath pushes away the dark pointing fingers of night. Restores equilibrium to the scales that have been tipped in favour of darkness. Outside my window a solitary bird, sings. Morning, beginning the slow ascent into the day. Opalescent sky reflected in my cup. A movement in the still surface, there is a bird flying in my coffee. I drink it up. The gentle grey green morning cradles me in its comfortable arms, there are no sharp edges or loud noises, just the soft slow hum of another day dawning. I hang from the moment. Twisting each second, stopping the tick, before it tocks. Darkness falls over the villages and towns and seeps into the quiet corners of the wildest places. High above, a single star, shines. Snow again. A light touch. A delicate frosting. Just enough to highlight edges, coat leaves and settle into the contours of twigs. Like icing sugar sifted on top of a cake, there is just enough to make the morning beautiful. There are diamonds in the snow, I see them sparkling. Tiny lights, brilliant and bewitching. Others walk on by. Can they not see the treasure that is glistening there on the cold and holy ground. Just twenty six letters to cover it all. To be able to construct sentences, to convey meaning, to voice the cavernous longings, to utter the quiet words that make a life run on into tomorrow. It is good that we have silence as a foil, an antidote, a resting place in case the pressure of words becomes too much to bear. Stepping out silently on icy feet December arrived. I was too busy juggling words to notice his swift approach. He bought with him a thin white blanket of snow and threw it far and wide covering the landscape. But outside of my window the blackbird and its golden beak still found the crimson berries and swallowed them whole. Another Sunday sprinkled with the stardust of silence. A vast empty hall echoing. Just waiting for me to break the quiet with the sound of my voice. The morning is blurred, hidden from my eyes in swathes of mist. A ghost of a landscape, just hinted at in light and shade. A pallete of greys dissolved in a watercolour wash, ethereal and waiting for the hours to focus the lens and give definition to the coming day. The words spill, dancing, bouncing onto the waiting floor. I rush to collect them, sweep them up, gather them before some passing creature feasts on them and has them for his dinner. They are my words and right now, I can't afford to waste a single one. Blank pages and unwilling fingers. Words waiting to be written. Queueing to be first out of my pen. But sentences need a structure to inhabit, a stage they can dance upon. So, while the story temporarily eludes me, there is nothing I can do but wait. Dripping honey and sunshine, the silver birch stands. Shivering drops of amber tremble around the white etched trunk. 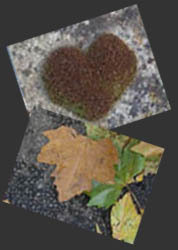 I overflow with gladness for the beauty of autumn and all its multi hued splendour. For outside my window the world is simply awash with colour, a pallete of jewels glowing in the soft yellow light. Silver birch, trunk white like paint scraped from a canvas punctuates the scene beyond my window. The sunlit trees stand in stark relief still clothed in summer, autumn has barely touched them here. Lithe and liquid eyed the squirrel makes his way along the fence and down the lilac branches into my garden. Car parked, waiting under the fluid shadows of the huge willow. Tarmac softened by its shimmering light. Breeze made visible, down by the river. October walked into my room unnoticed, and it is only now days later, that I see her sitting quietly in the corner wearing her faded green dress. The copper lights are already beginning to shine in her hair and I felt the subtle chill in the breeze as she opened her mouth and called my name. Dream weaver you have left me entangled in your hooks, daytime has come, but I am still haunting another realm. Not quite here, I am still swimming in night times ocean. Rushing head long into another day, I catch myself caught up in the barrage of thoughts that arrived with the morning light. I take a long deep breath and relax for just a moment. Looking out through the window I see the tall trees undulating in the breeze. Huddled men with crossed arms lean into lit matches, blow smoke like dragons. Breaktime chatter outside the busy warehouse. Shadows move on tarmac. Patterns like water, light made fluid by the breeze. An engine starts and the moment is broken, shattered by the lorries roar. Sky blue against white cloud piled high on the horizon like mountain peaks. ...and the rushing breeze lifts and plays in my hair. This dark velvet night, soft and quiet. Just the tick, tick, tick of the clock and the gentle purr of a snoozing cat. I wish my fingers were silent as they type these words, I don't want to add another sound to this beautiful moment. Dead tree, stark and sculptural, an exclamation mark against the opaque sky. Such a contrast against the vivid living greens. Death amongst life - just as it should be. I saw a rainbow, it gave me hope. There so blazen and glorious in the storm grey sky. The car park full of regimented cars ceased to exist, and for a moment there was only that technicolour sweep of joy. . . and me. Rain in sheets blurring the landscape, dripping from the bird feeders, pouring from the trees. Cats alert, listening to the low rumble of thunder. We all watch though the window as diagonal water falls from the sky. Rainbow coloured envelopes in a haphazard pile. Striped wrapping paper and glittery bows. ecards with loving wishes, tweets from friends. Smiles and happiness at a whole day of birthday still ahead! "Give up your identity as a seeker, and become a finder. Then everything you ever sought will find you." There are always doorways, between this, and that. Between you, and me. Most open at a push. Some need keys to fit rusty locks. Some never open at all. The still and silent morning. The soft whisper of my breath. The vast potential of another new day, potent and willing. Motion stirs the quiet field. Parked car, windows open. Slanted sunlight painting me with liquid yellow streaks, bold brushstokes warm to the touch. Fluttering shadows dance and shimmy like water, patterning the mornings surface with magic. Wisps of grey cloud float like smoke signals, haunting the twilight. Bats dive and swoop uncannily close to my window, speeding silhouettes on their nightly excursions. I watch the sky . . . waiting to see the Moon. Tie dye swirls of peach and blue as the Sun sinks down through the patterned sky. Magnificent and all aglow, the heavens are on fire with colour and celebration on this the longest day of the year. Six freshly bathed starlings artfully arranged along the top of my garden fence, fresh from the splashing bird bath they glisten as they preen and dry, iridescent in the sunlight. Sometimes silence settles on me like snowflakes. First a gentle sprinkle, then a thick blanket covering me with its weight. I am frozen in place, immobilised in this quiet cave, everything muffled by this igloo of solitude. Nothing but me and the cold sparkling silence. Dripping from abundant blooms the rain carries an infusion of lilac down into the dark welcoming earth. A tiny bird waits, taking shelter among glossy green leaves. The sky as white as paper. I see the cloud building a wall up into the blue. The storm grey horizon provides a solid base as it reaches up in artfully contrasting bands and hues. At the very top, brave white feathers are still holding on to the sunshine. The quiet cup that holds this still morning, is crazed with tiny hairline cracks of birdsong - almost imperceptable through the airtight filters of sound subduing glass. A subtle soundtrack to accompany the silent film that is playing on the other side of the window pane. "That's the thing with magic. You've got to know it's still here, all around us, or it just stays invisible for you." The soft rhythmic purring of a sleeping cat makes a perfect soundtrack to the start of my day. Cat two, jumps up to join us and slips - an acrobatic golden blur as he tumbles. Instinctively I reach out my hands to catch that ball of claw and fur. Crimson rivulets flow into the deeply etched lines of my rescuing hands. Cat safe and nonchalent, walks away. Lilac grows up into the endless blue of the sky - a splash of colour added to the vast palette of greens. Jackdaw on the fence post, his pale blue eyes a flash a silver among the shadows and sunlight. All it takes is a tiny shift in awareness and you will see it, opened up there before you. The world is awash with beauty. I opened my curtains this morning and illuminated in dawns soft pink light I saw it. Darkness amplifies the whispers of those marauding night time thoughts - they go stalking through the quiet hours, hunting for those to whom sleep will not come. That silent black realm seems vast when you are wide awake in the darkness, just waiting for the dawn to arrive. This morning the Blackthorn is wearing White - frothy blossom transforming the dark green of my distant view. Scarlet tulips edged with orange catch the morning Sun and light up like stained glass . . . illuminating this holy place. At my gate, fragrant pale pink Magnolia blooms are opening. All is well with my world today. The morning dance of weaving cats around my ankles, thunderous purrs from night warm fur. I pick up each individually and nuzzle my nose and stroke and kiss each gentle head. . . and so the day begins. Last night as darkness fell it creeped in through the big window in my room. Oozing across every surface, it filled the air. Every particle was dark and it entered me, riding my breath, covering my skin, it seeped into every pore. I sat motionless, holding the night inside me. The jackdaws are socialising in the big old tree, preening and chattering, wiping their sturdy beaks on the knotted branches. A sudden noise and they take to the air, Black brushstrokes daubed across a steely grey sky. I watch the swelling buds on the lilac bush outside my window. Dappled with sunlight, the tiny birds play amongst its intricate branches. Safe there in its tangled heart, they are shielded from the swift dart of the hungry sparrowhawk as he looks for lunch. Hands scratched and stinging, mud beneath my nails, I pull and gather, trim and cut. Clearing the way for burgeoning new growth to see the Sun. Exhilarated by the energy of the earth, I smile at my secateurs. Today the Sun shone huge sweeping golden beams - filling my room and leaving no space for me inside. I put on my shoes and stepped outside, just in time to join Spring as she arrived in my garden. Etched into the landscape the silver birch glows white in the gentle morning sunshine. A sliver of light climbs the fence and trickles over into my garden. Red berries highlighted in a dark corner feast on sunlight. March made a glorious entrance, decked with blue sky, white fluffy clouds and bird song. A beautiful day drenched in sunshine, it was as welcome as water to a thirsty soul. "The longer I live, the more my mind dwells upon the beauty and the wonder of the world." The sun, a welcome sight to these tired eyes that have stared too long at grey. Wheeling birds etched against a hopeful sky join me in relishing the warm touch. Thankful after being held for so long in winters ice cold hand. There they are, tiny shoots emerging out of the dark earth. Green appearing everywhere, beautiful signs of new life. It has started, Spring is on its way at last. Once again outside my window, a world swaddled in white. Another page written in the story of a winter seemingly without end. Huddled in distant treetops, birds sit, stoic against a laden sky. Moss. Verdant hillocks alive and in miniature. Lichen, yellow and grey, modern art adorning twisting branches and old walls. Beauty in unexpected places. Wet slate, cobwebs, crevices. Damp, grey green spaces. February. I have unearthed them again, tightly packaged and hidden in black plastic. They still exist. Out of sight but not out of mind. Colours and the creative urge, frozen in time. A burden that evolved from a blessing. I am wearing a dark cloak today, I feel its weight heavy on my shoulders. It falls around my feet in voluminous folds, a grey mountain range for me to cross. I am pulled from the blackness of sleep by the huge full moon hanging low in the sky. Its potent energy is palpable in this dark and silent space. I move to the window to see fresh snowfall, illuminated and sparkling. Thousands of tiny diamonds, scattered by the moons silver light. The year has turned a full wheel since I began to pour my thoughts into this space. The torrents never came. Just the gentle rhythm of words joining the drumbeat of my heart. The soft ticking of the clock a metronome, keeping time as the music plays on. . . The plentiful buds promise the sweet scent of lilac. Tiny bird, ever watchful explores the tangle of branches. Slanted shadows on the sunlit fence. Delicate white clouds flow like streamers, the pale blue sky a willing canvas. Sunlight touches everything. I race to go outside, so that I too can be bathed in those gentle rays. Nature is smiling today. Normality has returned. White absorbed into the green and brown earth. Trickling water pours into deep drains. Puddles on grey pavements quietly reflecting the sky. White world, thawed. The pause button has been pressed. January tip toes quietly, inching forward on white slippered feet. I rest in the lull that nature has dictated. Washing dries in front of the heater - fushcia coloured sheet, garish in the soft evening light. Yesterday it began to thaw. The gently receding snow made hidden things reappear. Colour was seeping in, high contrast against the stark canvas. Under the cover of darkness, night quiet and determined, threw another thick blanket across the land and this morning once again, the world is white. The sweet scent of hyacinths greeted me this morning, a strange juxtaposition against the icy white scene outside the window. We have settled into this snow covered world and adapted to its parameters, life goes on. I awoke to a cotton wool world. Deep, deep snow transforming the land. Piled high on every surface and sculpted by the wind, the outside scene is once again transformed into a blizzard of white. Swirling and dancing in the icy air it continues to fall, silent confetti muffling a subdued earth. Baubles shine up from dark floorboards, strings of silver bells meander across the rug, twinkly lights dimmed for another year. Festive sparkles harvested from the magic land that was my room. The sturdy brown box, open and waiting for treasure. The mantlepiece frosted with glitter gives a strange twist to the now barren room. I awoke from sleep dragging a dream with me. It was out of place in my dark bedroom, it sat uncomfortably on the edge of my bed. Tipped and unbalanced by its unexpected weight, I threw off the covers, fumbled for my clothes and stumbled into the day. Scattered strips of bright orange peel - a surreal sculpture in the dim light. Crumpled wrapping paper bubbles and spills from over full bins. Cats pounce and stalk on the once safe fluffy rug, transformed by new toys into a different and exciting place. Their ignored and unfamiliar fish treats stare menacingly upward, stranded and lifeless on the wooden floor. Outside it is silent as dawn breaks, pale pink tones added to the fading grey of night. The snow covered scene is breathtaking, a magical land beyond my window. All is calm, all is still, all is white. Another day begins. The land has been whitewashed overnight, the early morning light has a gloss white glare, illuminating golden yellow curtains and prewarning me of the change that has been wrought outside of my window. Huge flakes swirl in random patterns sculpted by the blustery wind. Up before dawn and it is silent, no sound but my fingertips tapping the soft black keys. The darkness is palpable, I can feel its weight. I watch through my window, ignoring the glare of my own reflection, as the dense blackness softens and begins to fade and once again light seeps in to the waking world. Early morning, the soft pink light casts descriptive shadows. Contoured limbs become feathery branches brushing the watery pale blue sky. Behind them, the ghost of the full moon patiently waits as the Sun rises. A fine mist drapes the treetops, wrapping the scene beyond my window. Still air and strange light highlights the intricately patterned lichen, modern art on twisting ancient branches. The yellow of the blackbirds beak shines like a tiny golden sun on this grey green morning. Reflective droplets of water dangle from the twisted branches. Light filled and liquid, they endure. The distant tree is roost to eight plump woodpigeons, feather fluffed against the cold. A robin lands and a water bauble falls, a solitary raindrop falling to earth. I can sense Winter approaching. Bare branches scratched onto the opaque sky. A certain quality of light that talks of colder times and gently whispers of sprinkling fine white powder to highlight natures bare bones. I can smell it on the breath of the wind. Winter is coming. Neighbours leave freshly dug vegetables on our doorstep, the compost bin we gave them will help in next years crop. Root vegetables chopped in chunks ready for a dinnertime stew. The beautiful trees sway against the clear blue sky. Birds queue on the fence waiting for me to scatter seed. The church bells chime the hour. The lilac bush outside my window a kinetic sculpture - alive with birds, hopping from branch to branch, random and beautiful. 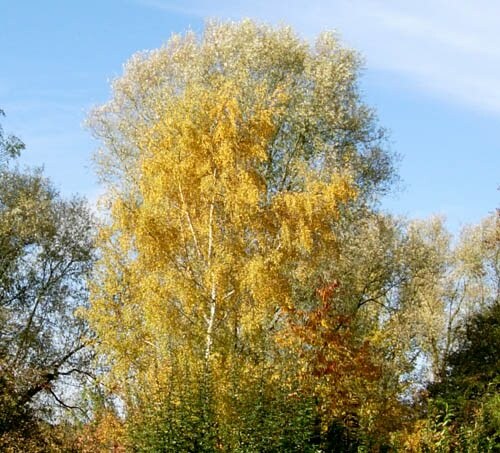 The Silver birch is glowing in the morning light, its remaining leaves, gentle moving amber jewels. I start my day. My curtains open to a grey morning. Adorning the distant wire top fence the starlings, doves and woodpigeon are interspersed with sparrows who act as surreal punctuation in this sentence of birds. A blackbird swoops down to join them as the jackdaws circle overhead, turning cartwheels in the mist. Afternoon sunlight daubs the pared back landscape with golden brushstrokes. Trees etched against a painted sky, intricate branches burnished with liquid yellow. A moment later the light has gone, taking the paint effects with it. Red berries against deep green leaves, their colour so vibrant through the curtain of falling rain. The lilac branches a landing strip for small eager birds who don't seem to notice the weather. The leaves have gone from the big Lilac bush outside my window, exposing an angel hanging from the branches that I had forgotten was there. November has blown in on brisk winds. Blowing and billowing, bellowing its arrival through cracks and openings. Tunnelling down empty chimneys and racing around after skittish cats. Herding leaves into dead end corners and shaking fences to prove their worth. Dusk. Black etched trees, silhouettes against a grey striped sky. The racing wind collects leaves from dancing limbs, whistling as it passes. Pushing the fence with insistant nudges, the old wood creaks and moans but holds its ground - the wind moves on. The old mattress leans like a fallen monolith, narrowing the already crowded hallway. Meanwhile its successor, plump and comfortable, makes itself at home on our bedframe. "For sleep, one needs endless depths of blackness to sink into; daylight is too shallow, it will not cover one." Windows open, I hear the rain fall. Drops explode, then drip from the pitched roof of the bird table, inside a solitary sparrow waits. He flew, he finally flew. The endless months of metal and plans, the will it? won't it? questions finally answered and put to rest. The spinning propellor, the majestic wing, his amazing perserverance and belief in his quest allowed him to take to the air. He flew, he finally flew. Night time streets, dark and deserted. The golden half Moon, pinned low in the big velvet sky. Curling wood smoke and the screech of an owl cut through the crisp blackness. Glowing lights behind drawn curtains hint at life, as we walk together in the dark. The leaves begin their slow journey from summer green to autumn's fiery jewels. Glimpses of saffron yellow and burnt orange amidst the sea of green, picked out and set aglow by the sinking sun. Day and night, balanced again at this equinox point. The year is turning and autumn is returning to the land. The sheer volume of my possessions sometimes weighs me down. So many things, cupboards full, boxes overflowing. It feels stifling, claustrophobic. I long for space around things, for room to breathe. Once again I am ripe for a clear out. It is a time for letting go. Limb by limb the beautiful branches of the old Willow tree are removed from the sky. Blue instead of green now seen from the window. All things change. Life moves on. Today I can feel the weight of the heavy sky. Blankets of cloud slung low and grey touch the treetops, unmoving in the still evening air. Dusk creeps slowly, absorbing the fading light in its path. The atmosphere is palpable, I can sense the pressure. The heavens are embracing the earth too tightly today. Cats piled up on my desk - a purring mountain of warm fur. Outside, washing blowing on the line - bright colours flying like flags against the blue sky, clouds hurrying along, shepherded by the insistant wind. August is saying its goodbyes. Waving farewell, with blustery winds, with shivering trees, with clouds scudding across a grey sky. Blustery winds and black, black skies have relinquished their place outside my window. This morning I see sunlight sculpting the limbs of the huge old tree in the distance, the bark of the silver birch glistening white, leaves still in the morning sunshine. A flock of busy sparrows dart back and forth to my birdtable. Calm has returned to my garden. Early morning sunlight casts a perfect silhouette of my lilac tree on the frosted glass of my kitchen door. Liquid yellow light runs in rivulets across the terracotta floor. Timing just perfect for my newly opened eyes to catch this beautiful moment. In minutes the Sun will be higher in the sky and that rare scene will be gone and no one else will witness the beauty that was in my kitchen this morning. I sit, grounded, earthed. A large boulder in the zen garden of my life. My thoughts, carefully tended patterns, swirl in the pure raked gravel of my mind. The single tree, my focus, shaped over many years by careful pruning. Everything is still, serene, unmoving. The day before my birthday and I feel strangely resolute. Dancing thoughts hover just out of reach, resisting my attempts to pigeonhole the sparkling fragments of possibility. My aura is filled with stardust, there is magic in the air tonight. Soft fine rain blurs the edges of this August day. Silence, a quivering leaf, the hopping of sparrows in the lilac bush. I feel as muted as the subdued pallete of the colours outside my window. Nature and my being are both being viewed through a soft focus lens today. Evening Sun riding low in the sky rounds the corner of the building and abruptly streams into my room where seconds ago it was almost twilight. I am dazzled by the light and then by the realization that it is the rotation of this, our planet Earth, that caused this sudden illumination where moments before there was none. Another room, another window, another view. There is nothing but green as far as my eye can see - layer upon layer of green, rich with texture and changing hue. Not wanting to disturb the scene, a green woodpecker lands and eyes me warily as I adjust to my new lair. Dancing shadows play across the wall, sunlight glints on everything shiny. There are pools of light in dark corners. Outside, white butterflies flutter like floating flowers. Pinned like delicate brooches to the Buddleia blooms they collect the nectar that is their life. The thought crosses my mind, am I collecting nectar, or am I still fluttering around the bush looking for somewhere safe to land? From my window I can see the rain. Sheets of water flung from the grey, grey sky. The arching buddleia blooms, vacant of butterflies in this deluge, drip, as they bow to the weight of the downpour. New metal bird feeding station, stands Black and stoic, the only visitor a cautious Dove with liquid eyes. I have pulled back the curtains covering my window. My dawning realisation, that as well as stopping others seeing in, they were stopping me seeing out. White lacey froth now clipped up in flounces, no longer a screen but a frame for the view. I can see the flowers, the vast sky and the deep green leaves moving in the gentle breeze. The pay off for privacy was far too great. July brings extra blankets - stifling heat. Slow motion days with heavy air and ripe gooseberries. The blackbird feasts on redcurrants, golden beak devouring the shiny red jewels. He clears the bush in days, he can have them this year with my blessing, there is plenty for us all. A subdued morning - a pallete of neutrals after the primary colours of yesterdays sunshine. The sparkling water, the agile sailboats and the blue green wet paint on the shop windowsill now just a memory. Television ariels tattooed on the blue and white striped sky. Yesterday the young trees trembled before the terrible wind, today it is calm and they are stronger. Outside my window, the opalescant sky like a huge lightbox - silhouetted birds like paper cutouts scattered on its surface. Abundant greenery narrows the path to the gate, lush foliage reaching out as I pass, touching my shoulder and reminding me of summer. Sunlight pours through my window, drips down the couch into a golden puddle on the wooden floor, awaiting a passing cat. Everything has its own innate beauty, some obvious, some takes investigation, but it is always there, always part of the package. Sometimes you have to make an effort to look at things a little differently to appreciate its value. May is racing ahead, sunshine and showers reflecting my moods. I have not settled into the warmer temperatures or the lighter evenings. I still feel like a stranger in my garden and realise that I haven't yet taken off my winter clothing. Clematis smothered with huge cream flowers, cornflowers at its feet piercing the grey morning with colour. Burgeoning nature bursting from the confines of the brick edged beds, a riot of green energy vital, vibrant, alive. I observe from my kitchen window, mesmerized by it seemingly growing before my eyes - behind me the kettle boils. Locked inside myself there can be no movement. Dark clouds in the grey sky a mirror. Soft rain falls on the gentle earth, soaking us through to the bone. A gentle morning awash with pale sunlight and promise. The bare bones of my garden now filled out with lush new growth, spring greens and pink flowers sing with joy, the blackbirds golden beak shines like the sun. Rain falling, refreshing yesterdays sunwarmed garden, everything drinks deeply, fuel for another bout of growth. Raindrops on my window panes, sparkling like diamonds. Bluebells filled the woods with sweet fragrance, shiny bark and twisted limbs catching sunlight, ground soft underfoot welcomed our feet. Out of the shade and into a clearing, we followed a path to the now fenced meadow and looked back at the place we used to live. Some days demand retreat, they scream go back inside, close the door and turn out the light. Cover your head with a blanket, curl up in a ball, dark, silent, nothing but the sound of your breath, in and out, in and out. Block out marauding thought. Wait patiently until your skin grows back. I awoke today with a cloak of quiet wrapped around my shoulders, my inner being calling me inside, the outer world can do without me today. Sunlight spilling on scuffed floorboards, streaks of light reminding me of another time, another morning, another sunlit room. . .
Saturday morning still and calm, holding its breath so as not to ruffle the scattered magnolia petals, strewn like giant confetti on the damp earth. The sky low and heavy, dove grey and thinking of rain, the eager garden awaits its promise. The scarlet of the tulips, a strike of colour in the greyscale morning seen from my window. A punctuation mark piercing the damp new day. Branches clothed in brilliant green dripping with jewelled raindrops, set against a steel grey sky. Art is everywhere! Thursday has been painted with a watercolour wash in shades of grey. Natures pallete muted and subtle, shadows and form replacing colour. Another full moon. I awoke with a start last night, to find the Moon peering in through my curtains, watching while I slept. Night folds around me like a cloak, the deep velvet blackness heavy with silence. I hang in space. Deep within, the stars begin shining, pinpoints of light cutting the endless night. April yawns and stretches in the warm sunshine, welcoming the new month with extended arms. Nature is optimistic, rushing to fill every corner with new life, succulent spring green spreading over the land. The fool stands on one leg reaching for the glittering star above his head. It's all fools day and the light now outweighs the dark. A thoughtful aura hangs in my atmosphere today, an internal quietness. I sit deep inside my being, still and subdued. New moon tonight, so tiny in that huge black sky, another start, another cycle. May today bring us whatever we are in need of. A time for balance. Dark and light have the same weight. The fleeting moment that contains equal measure, we all have those. Scales balanced, equilibrium obtained, hold your breath. Time moves, light grows, darkness retreats until next time. A beautiful morning. The Sun running like a tap filling my room with joy. No trace of yesterday here. Just the glorious now, laden with promises of tomorrow. Winter has retreated leaving the year to start again. March has redeemed itself. All is well. Weaving sunshine with showers, grey sky and blue, melancholy and joy, the month marches on. Worries that come to nothing leave a slimy trail across my mind. Dragging a past laden with spikes opens old scars my delicate skin has not yet healed. Time moves on, seasons change. There are strange feelings in the air, nuances so subtle as to almost go unnoticed. Sensitivity to the virtually imperceptable can unsettle me, with undercurrents that are tugging at my ankles beneath the smooth surface water of life. Full moon moves the tides, tomorrow things will be clearer. March has opened its door and I warily step inside. Strange feelings wrap my being of late, as though the dream world has sprung a leak and is seeping into my reality. Feelings change like weather, and my mists will surely lift as a fresh breeze blows through and the sunlight warms the air. Until then, I stand in the doorway and wait for March to roll out its road before me. The air is still and the milky sky hangs heavy over the silent houses. The birds etched like tattoos on the grey clouds. Tonight a new moon will slit the sky with its tiny crescent, cutting the black with a pale glow as it begins its journey to transform from delicate sliver to full round light. But today the air is still, the land waiting, the cycle has not yet begun. Spring is stalking my garden. Snow recedes slowly as new life breaks through the cold, cold, earth. Birds sing songs of encouragement to a shy Sun. Pale green takes its first breath and I watch cautiously as hope returns to the land. Middle age has thrown her cloak around my shoulders, the distant stalker is now standing in my shadow. The years and gravity pulling on my face. Shouting at me from the mirror. Sadness, as I realise that I haven't yet figured out what I want to be when I grow up, that someday isn't a magical place. and that options, like arteries, narrow with age. We are all alone. We play at connection, at families, at friends, at lovers. Partners joined at the hip, friends forever, part of a group, part of a gang, part of something. Ultimately, we are all alone in our own skin, our own mind, our own feelings, our own perceptions. However much we wish it were different, it's not. We are alone on the island called me, waving frantically at ships passing in the night. Snow, a soft white blanket covering over the stains of everyday life. All is clean, white, virginal, new. Yesterdays litter hidden. Winter branches bent under the weight of the decorators white sheet. everything sparkling in the half moons light. Untouched, unspoiled, awaiting tomorrows footsteps. Another day, another month, gobbled up by a hungry year. Time races, rushing to achieve, to do, to consume the busy hours. The continual stream of ‘now’ moves so fast, like a silent film star, jerky black and white moments that are quickly woven into the tapestry of today. Strange, abstract patterns giving texture and movement to the rich garment of this everyday life. So much for the flood of words I thought were building behind the dam of my silence. I have opened the floodgates, given the words permission to flow and what do I find, a drought upon my parched land. The cracked dried earth of my expectation, barren. And I need to talk. Not about anything in particular, just words, just to see them appear on the page, just to watch the flow of consciousness. Just to see what I have to say. Maybe I won’t have anything much to fill these pages. Maybe once I start, there will be torrents swirling around my feet. Maybe I will have to find higher ground so as not to drown in my words. Maybe, I won’t. We’ll see. These are my. . .
Hello and welcome to my blog. My name is Susannah and I started recording these captured moments back in January 2009. Since then, this blog has slowly become a record of the landscape of my life. This moment has gone. . .
perhaps a singing bird will come. A Visitor To My Window Ledge . . .
Vet's surgery, Loudeac, morning. The last thirty words. Some Things Can't Be Bought. and look at what can be. of loveliness elude us every day. you will find this to be so.